Washington : Weather on Venus is way too different during nights as compared to day time, reveals a new study. The researchers have found unseen, unexpected cloud types, morphologies and dynamics largly due to topography of the planet. "While the atmospheric circulation on the planet's dayside has been extensively explored, there was still much to discover about the night side. We found that the cloud patterns there are different to those on the dayside, and influenced by Venus' topography," said Peralta, lead author of the study published in the journal Nature Astronomy. The atmosphere on Venus is a result of 'super-rotation' - a phenomenon under which the speed of winds can be noticed faster by up to 60 times that of the planet itself. Due to super-rotation, it has been noticed that the clouds travel fastest at the upper cloud level, some 65 to 72 kilometres above the surface. 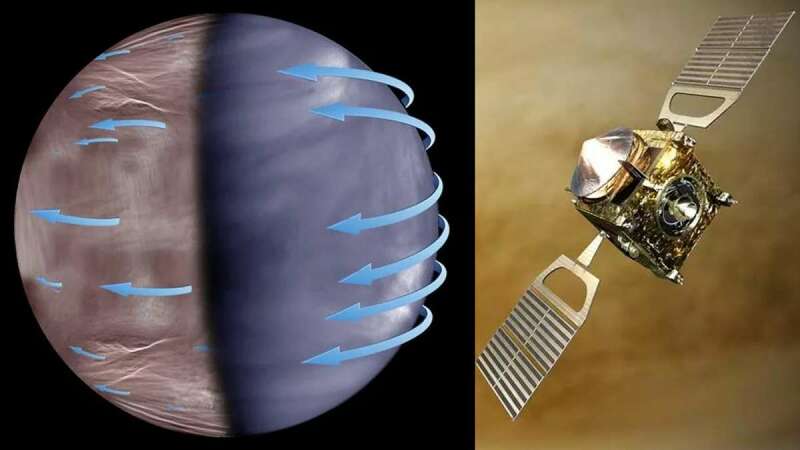 "We've spent decades studying these super-rotating winds by tracking how the upper clouds move on Venus' dayside-these are clearly visible in images acquired in ultraviolet light," said Peralta. "However, our models of Venus remain unable to reproduce this super-rotation, which clearly indicates that we might be missing some pieces of this puzzle," he said. "We focused on the night side because it had been poorly explored; we can see the upper clouds on the planet's night side via their thermal emission, but it's been difficult to observe them properly because the contrast in our infrared images was too low to pick up enough detail," he added.